The grass is always greener when it gets plenty of water. And to make sure your lawn is ready to go-and grow-in the spring, it’s essential to make sure that your sprinkler system survives the winter. Homeowners may not realize that in-ground irrigation systems are susceptible to harsh winter weather. Fortunately, there are just a few simple steps to get your sprinklers ready to weather Jack Frost’s deep freeze. First and foremost, does your sprinkler system run on an automatic timer? If so, be sure to shut down the controller before the cold winds blow through. Many systems have a “rain” or “off” mode that turns off the signals to the valves. Even though the sprinklers don’t activate-because the valves are closed-the system retains all programming information (start times, valve run times, etc.) and continues to keep time. Another option is to shut the controller off completely; however, this generally wipes out any programming information that may be stored in the system, so you’ll have to reprogram everything once the ground starts to thaw. Next, shut off the water supply. And while you’re at it, be sure to protect the main shutoff valve by wrapping it with insulation (foam insulation tape and a plastic bag). If you don’t have a main shutoff valve, it can be a good, protective investment. Meanwhile, above-ground pipes need to be insulated, too. Most home supply stores sell self-sticking, foam-insulating tape and foam-insulating tubes for this task. If the cold weather is on its way, it’s crucial to remove water from the pipes and sprinklers so that the water doesn’t freeze and cause pipes to burst. Manual drain valves, automatic drain valve and the compressed-air blowout method are the three most common ways to drain pipes. An irrigation specialist can help you get the job done while protecting your lawn and your property against the potential hazards. Backflow preventers and valves also need insulation if they are above ground. The insulation tape used for the main shutoff valve can be used on this equipment as well, but be sure not to block air vents or drain outlets. Before you attempt to winterize your irrigation system, it can pay to consult an irrigation specialist such as those at Thornton Sprinklers. 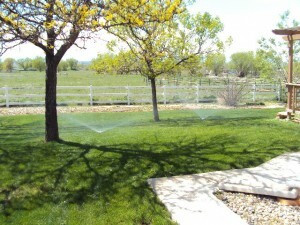 ‹ Automatic Or Manual Lawn Sprinklers: Which Should I Choose?